The past couple weeks have been different for us compared to the past 6 months. Rather than only having only an average of one day off for a weekend, Curtis has been having consistent one and a half days or even 2 full days at home! We haven’t been able to travel or do anything especially adventurous over our extra time, but it’s been so nice to not feel like we have to fit adventuring, chores/projects, and relaxing into one day. On the first weekend of October, we decided to go out on Saturday and do some shorter, easier hikes with Charlotte, then maybe something longer on our own the next day. Anyway, we made our way around them and to our trail, which came close to the course but not in the way. I think the races were wrapping up when we arrived at around 9:30. We passed through the golf course and made our way to the ocean. Besides two fishermen right at the beginning, we were all alone for our coastal walk. 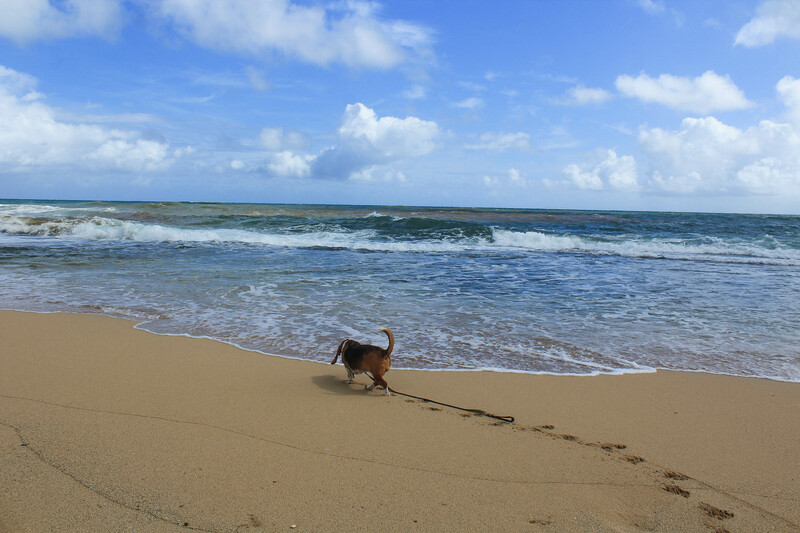 We made our way North, either walking through the sand or along the coral, looking out for monk seals or other creatures. The only wildlife spotted today were crabs scurrying across the sand, which Charlotte would chase around until they ran into an incoming wave. She would wait for the water to recede, then would be completely perplexed when there was no trace of the crab. Along the way, we spotted some cool coral and shells. However, there was also more trash and plastic lying around here than we’d seen at any other beach. I’m sure you’ve seen pictures around the internet trying to bring awareness to the amount of plastic waste that ends up in the ocean and on beaches, but here we were walking through proof that it exists, and it was heartbreaking. 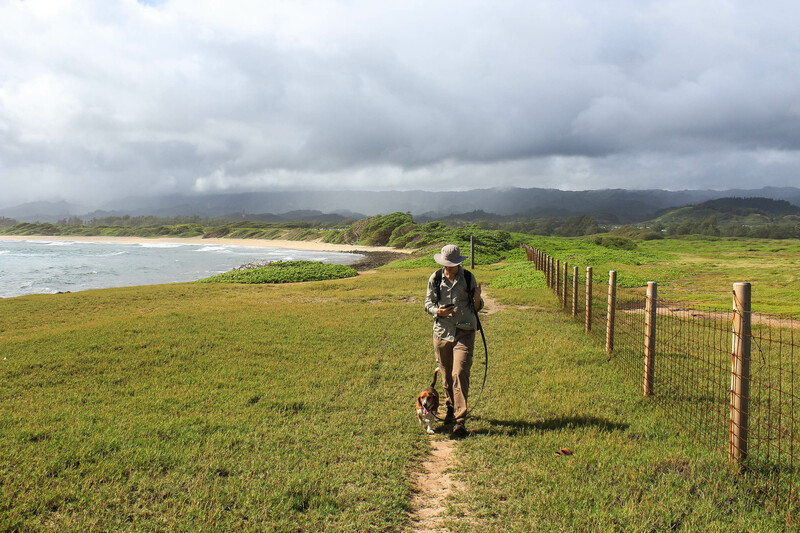 We wandered just over a mile along the coast headed towards Kahuku Point, but ultimately ran into a stream filled with high, brown water and said “No thank you!” Occasionally after it rains, there will be ‘brown water warnings’ across the island, which usually means sewage or other run-off is in the water and there are high bacteria levels. Clearly, it’s not smart to play in or cross water like that, so we turned around and made our way back to the car. 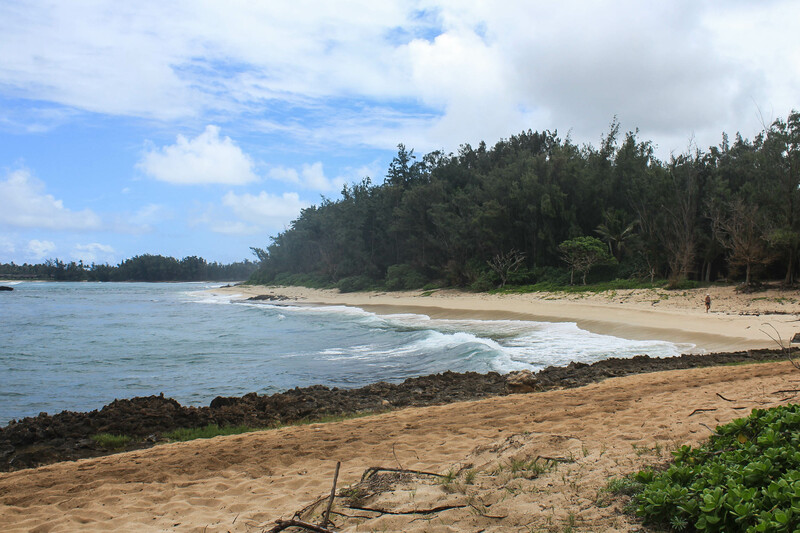 For our next short walk, we drove North just a little further to the other side of Turtle Bay resort and parked along the road near Kawela Point Beach Park. Here there are many paths going out to the coast and through the trees. They are mainly developed for guests at the resort, but there seemed to be a lot of locals at the beach in the neighboring bay. Curtis’ motivation for exploring this area was to find a letterbox, but it turned out to be a very pleasant walk with a few surprises along the way. 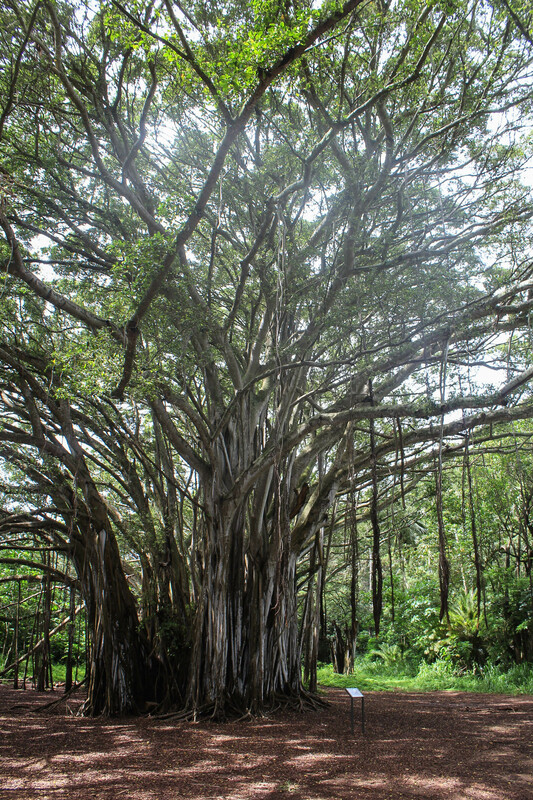 The first ‘surprise’ was a huge banyan tree, one of the widest that we’d seen, that is actually somewhat of a celebrity. 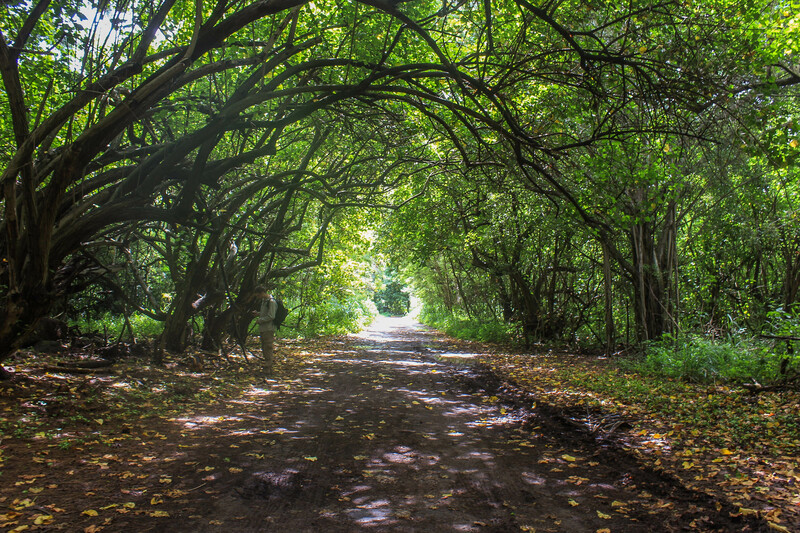 A nearby sign read that it had been a backdrop in both Lost and a Pirates of the Caribbean film. Curtis went in search of a geocache while Charlotte and I went to check out the quiet beach. I was hoping to see sea turtles, but there weren’t any out today. (I still have yet to see one here — if I don’t see one while living here I’ll be very disappointed!) We walked back to find Curtis. I spotted him right away slightly hidden by the tree, but Charlotte could only hear and smell his tracks and it took her a bit to find her way to him. As it turned out, while he was searching for the geocache he accidentally came across a letterbox! I thought that only happened in Connecticut! We had parked near the Kahuku Farm fruit stand, so we stopped by to pick up a breadfruit, something Curtis had been wanting to try. We’ve tried to forage it a few times but haven’t had any luck, and didn’t want to miss our opportunity as ‘breadfruit season’ is coming to a close. After a little experimenting in the kitchen, he ended up making breadfruit fritters which were pretty good. Unfortunately, we noticed once we were home that Charlotte was having some issues, so instead of going for another hike the next day, we stayed at home monitoring her and taking her to the vet. While we were sad that taking her for a long walk had turned out this way, it was good we did take her because otherwise we wouldn’t have noticed this possibly ongoing issue. She seems to be on the mend now and hopefully will do better next time!